I’ve been sick for the past couple of days, so this is coming out late. It’s been over a week of playing at night and I have no idea how close I am to completing the game. It. Is. Awesome. Well, I have now cleansed my sword in the second fire, completed the final two trials (thank goodness), learned another new song, and am at the door step of the next temple … but now I need to go and get me some water so I can continue! 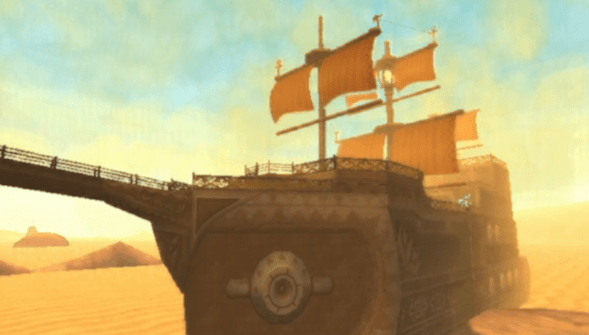 So, you’re in the desert and then you find this ship … in the desert. You hit the crystal and then you have a little circle where you see water. So cool. You’ll understand when you get there, but this is seriously one of the coolest parts of the game so far. You are in a little circle of ocean in a sea of sand. Very cool. Finally, you get to the temple here, and yes, it is a ship in this sea of sand that you had to track down and knock out. It’s called the Sand Ship and it is a lot of fun, even if it includes a lot of back tracking in order to complete (since it is only one ship). Finally you end up facing the boss, and it is one of the easier ones as long as you know what you are doing. It isn’t hard, but it was fun (and the boss looks kind of silly as well). You get the ability to use your dowsing ability on more objects and then you are off to get the next song. It is here that I completed a couple of side quests just for fun, stocked up on some needed potions (I have one fairy and two heart potions with me at all times), and then it was off to Eldin Volcano for the next temple. I’m happy I’m done with the trials. It’s not that I didn’t like them, it was just that I had to die at least once on EVERY ONE. Oh well, I completed the trial and now I can withstand the great heat of the volcano so I can progress. Progress I did. All the way to the final gate to the temple and I find out that I need a huge amount of water in order to get through. Well, where do you find a huge amount of water? It’s back to the Water Dragon!